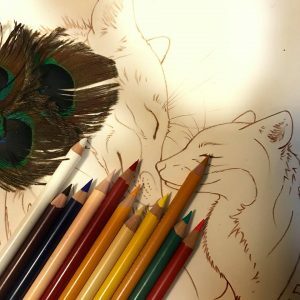 When coloring I often create a watercolor effect using only pencils. 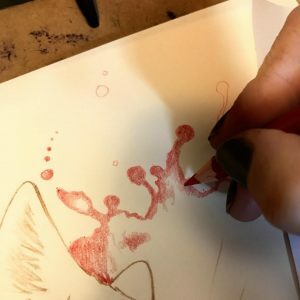 I like the careless look of splattered paint, but I don’t always have paints available, or perhaps the paper I am working with does not allow the use of water color. 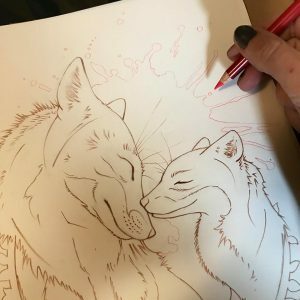 I am not exactly sure when I started doing this, but I noticed that I do it a lot more often lately, in coloring other artists’ line work as well as in my own original drawings. 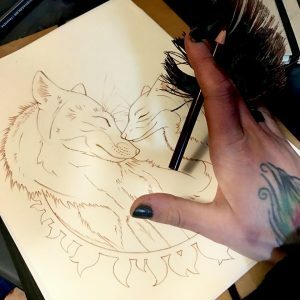 Many of you on The Art of Lisa Mitrokhin have asked me to share my secret technique, so here it is. Let’s walk through it step by step together. 1. Many colorists have coloring books that we value and fear to damage. 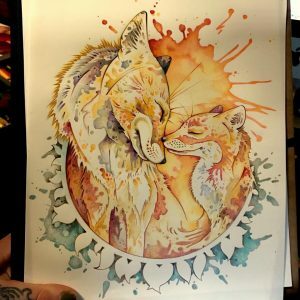 Water color coloring can be awesome, but the paper in your book may not be ideal for that media. Well, you don’t have use actual water color. You can create the same effect using only pencils. We will start with the outline. 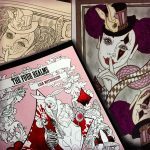 You may be working with a coloring page or an original drawing. 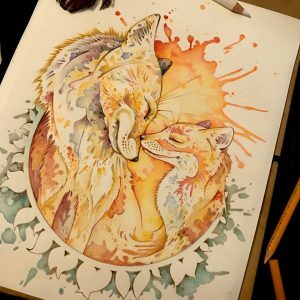 I drew these foxes to practice on. 2. First, pick you weapons. Pick a pencil, any pencil. Don’t mind the brand, just as long it’s colorful. Pick out the ones you would like to work with. You may want to add more later. 3. I like to look at samples of real water color paint on paper. You may practice with actual water colors on a separate page, or look up some images on line. Whichever you choose, I suggest you always have an inspiration sample to work with. Study the way water flows. Note the general shape and the fact that paint is darker at the edges. 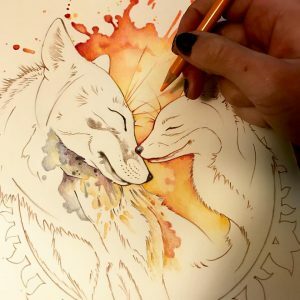 Learn to recognize the nature of water color. Then, begin your outline with the color of your fake paint. In my case red or deep orange. 4. Begin to roughly pencil in your darkest color at the edges. Do not press too hard on the paper, just gently add layers. Don’t worry about it being smooth and flawless at this point. Just start adding your color. 5. Switch to your blender. A blender can be anything – a tip of your finger, a small piece of paper, a cotton ball, a light eraser, and actual blender, or in my case a q-tip. 6. 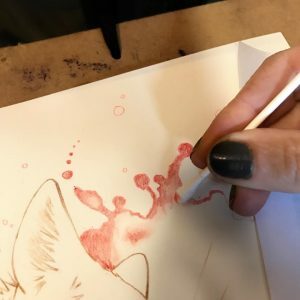 Keep adding color and blending it all around your water color stain. Remember the element of randomness associated with water color paint. Don’t try to be symmetrical of mathematically balanced. Leave it all to chance. This is not something you plan. This is something you feel. 7. Now continue further into your water color stain, adding lighter and lighter colors, and blending along the way. 8. 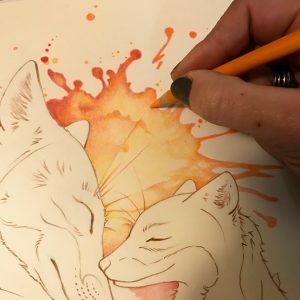 Here I am using my lightest color.I may go over the lightest parts with a white pencil afterwards to smooth the transitions even further, but it may not be necessary. 9. Now I will continue to fine tune the edges as well the darker spots until my water color splatter looks realistic to me. 10. 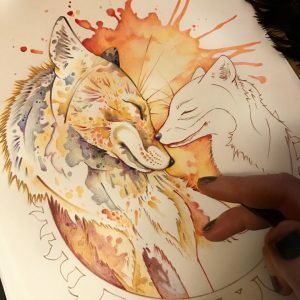 When you switch to a different element (like I just switched from background to fox) try using a different type of paint splatter to create different textures and dimensions. 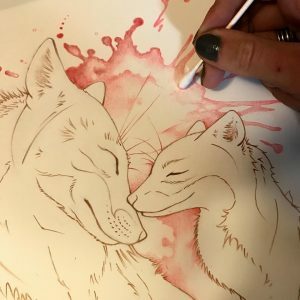 I will make my foxes more splattered to suggest fur. 11. At this point I am completely at the mercy of my drawing. It pretty much tells me what needs to be done. I am not planning or even making decisions. I am balancing. I look for a disbalance in color and tone, and I fix it. 12. While we want to use some kind of a blender all throughout the process, we do not want to straight up smudge the image. 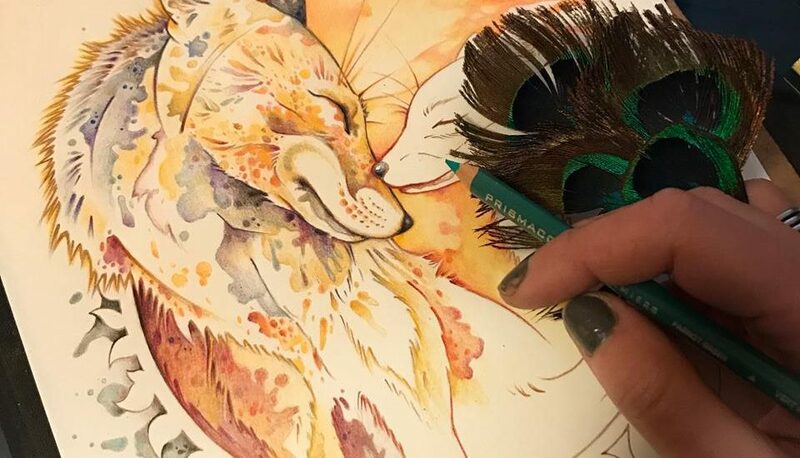 To avoid unwanted smudges I use my peacock feather to brush off the blender dust or pencil tip crumbs that sometimes happen. You can use any type of feather or brush. A soft makeup brush for instance. 13. and voila! After an afternoon of placing seemingly random bits of fake paint splatter, we can step back and admire our foxes. 14. This image can be approached a million different way. I went for splatter effect because that is particularly difficult to achieve using a traditional method without also soaking the page. But you may go with a more tidy appearance. 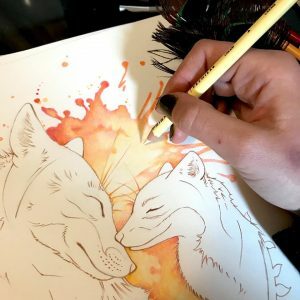 You can use clean lines and smooth color transition, but always keep in mind the random color gradient that comes with real water color paint. 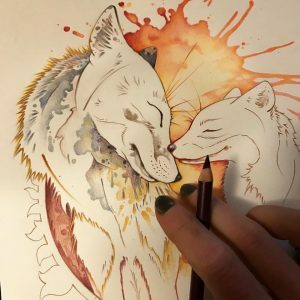 I hope you try to play with my super secret water color effect and I hope to see some of your work. Enjoy. 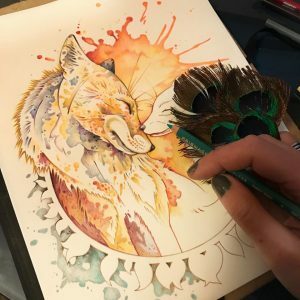 3 Responses to " Water color effect tutorial "
Wow, love it! Really wanna try this.